So, you go out to your garden and find your tomato plants defoliated. Ugh…. NOT what you wanted to see. Don’t take the chance of tomato hornworms ruining your tomato plants this summer! 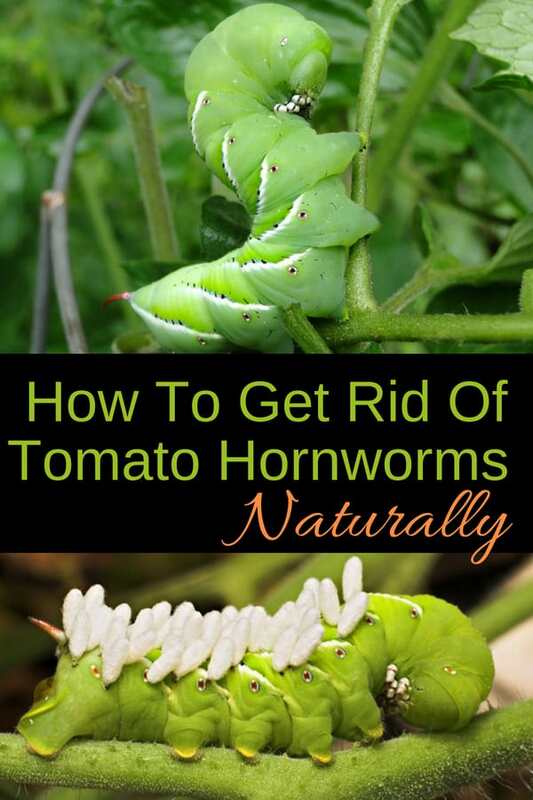 Here’s how to get rid of tomato hornworms naturally. You need to take action the moment that you notice them to ensure that you are stopping the problem from spreading to all of your tomato plants! The tomato hormworm is a the larvae of the beautiful sphinx moth. They start their life cycle hatching and growing into green caterpillars. 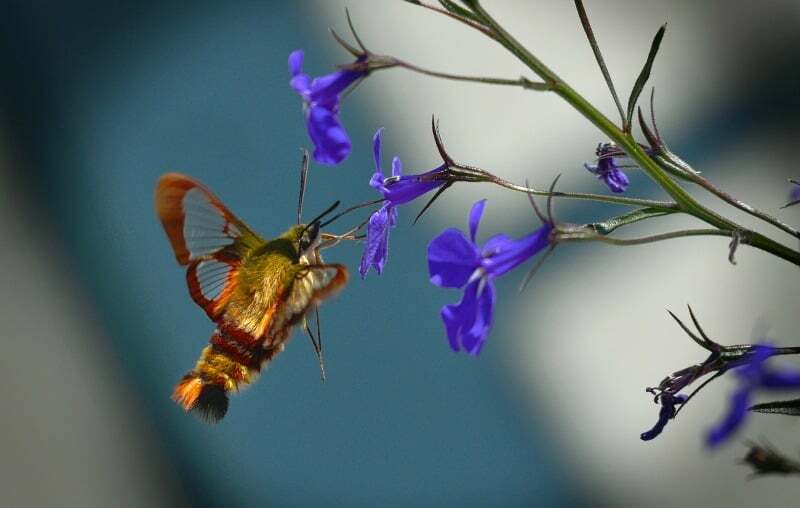 And even though these moths are beautiful, I don’t want their larva on my tomatoes. If you’ve ever noticed these green “worms” on your tomato plants, this is cause for alarm! They can be quite large (they can double in size in one day), up to several inches in length and can do quite a bit of damage during this phase. Their coloring is a green body with varying marks colored in white or black. Plus, they have stripes on their body as well. Identifying those markings early will help you plan your next steps in identifying how to rid them from your tomato plants. 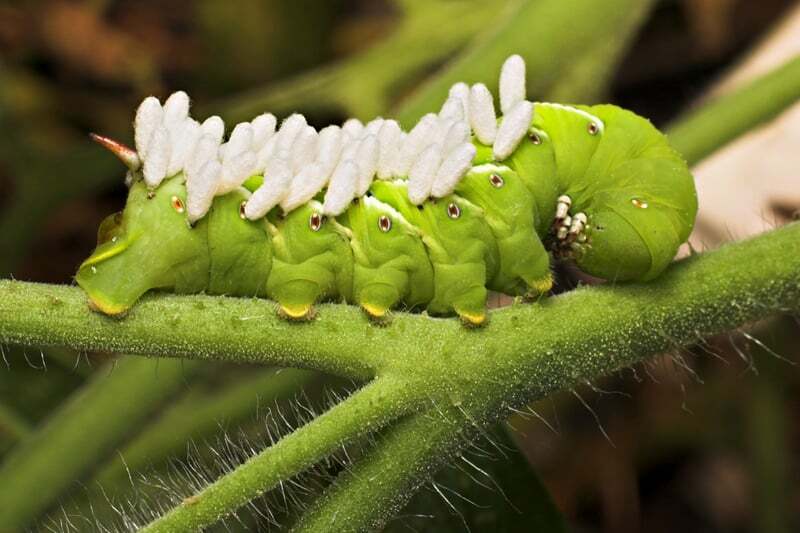 What Damage Can Tomato Hornworms Do? 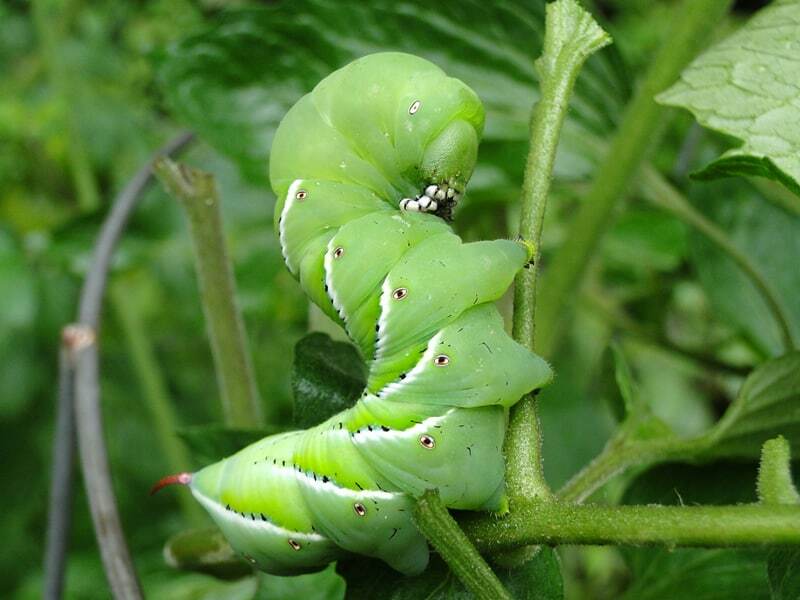 Tomato hornworms have the ability to destroy your tomato plants and crops! They will eat through the leaves and work their way through the remainder of the plant at an extremely quick pace. If you are worried that you may have tomato hornworms in your garden, here are some clues that you might be absolutely right! EVERY SINGLE DAY you need to go and check on your tomato plants. If you notice leaves that look to have holes or are starting to become a bit droopy and wilted, you need to take a closer look at the plants. Get eye level with them and look under the leaves to see if you notice any worms. You’ll also see hornworm droppings in your tomato leaves or on the ground under your tomatoes. The hornworm poop might be easier to spot then the actual worm. The droppings are also green, and they look like pellets. If you see any signs, caterpillars, cocoons, or droppings, it’s time to take the next step on how to rid your garden of tomato hornworms. The longer you delay, the quicker they will spread. There are other tomato pests and diseases such as aphids, white-fly and red spider mites. Learn how to protect your tomatoes from these here. If you see a hornworm with lots of white pods sticking out of it, leave it alone. It means it’s been infested by wasps it will soon die. The good thing (and probably the ONLY good thing!) about tomato hornworms is that they don’t bite or sting humans. Therefore, you can easily grab them and remove them by hand to get them off of your plants. Depending on how many you have, this process could take a while, but in order to save your garden, it is necessary! What can you do with the worms once you pick them by hand? If you raise chickens, you can feed them to your chickens. Or, add them to your bird feeders. And if you like to fish, they might make good fish bait. Keep the chemicals off your tomato plants and opt for a more natural solution instead. Combine liquid dish soap and water and spray the plants and worms until covered. This should kill off the tomato hornworms without causing any type of further damage to your garden plants. Some also say that covering the outside of the plants with a bit of cayenne pepper can also help to keep the worms from coming back, in case rain comes and washes away the soap/water combination before eliminating them. Naturally occurring bacteria that attacks caterpillars, but leavers beneficial insects alone, sprays made with BT are safe for your tomatoes and safe for the insects we want in our garden. Keep in mind that tomato hornworms also like other garden vegetables besides just tomato plants! Always monitor your peppers, potatoes and eggplant plants as well to ensure that you don’t lose those crops, too! The sooner that you catch them and get rid of them, the better the chance that your garden will rebound and produce! if they are a moth, would you or want to keep them contained to morf into the moth? besides tomatoes plants what and how to do this? I usually just dust my plants with ‘all purpose’ flour… the worms injest, but cannot digest the flour..and this will kill them. I have prevented the worms so far this year by planting dill plants right next to my tomato plants.